ATMOPAV, the Association of Teachers of Mathematics of Philadelphia and Vicinity, was founded over 50 years ago. An affiliate of NCTM and PCTM, it is an organization of educators who are dedicated to the improvement of mathematics education at every level from kindergarten to college. ATMOPAV serves hundreds of members in the five-county area. 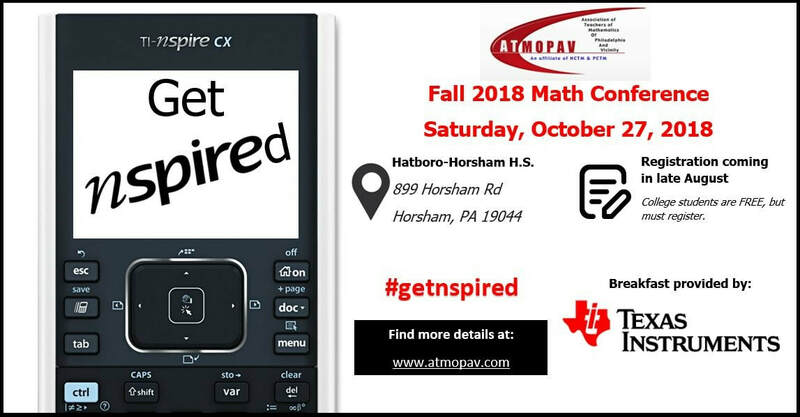 No-cost registration for two conferences with workshops conducted by successful teachers and speakers who bring fresh perspectives to mathematics education. ​Recognition of local achievement in mathematics education through a student competition, awards for exemplary student teachers and novice teachers, and grants for classroom projects.